The Dartmoor longhouse is a type of traditional stone-built home, typically found on the high ground of Dartmoor, in Devon, England and belonging to a wider tradition of combining human residences with those of livestock (cattle or sheep) under a single roof specific to western Britain; Wales, Cornwall and Devon, where they are more usually referred to simply as 'longhouses' and in general housebarns. The earliest are thought to have been built in the 13th century, and they continued to be constructed throughout the mediaeval period and into the Early Modern, using local granite or other stone. One particular longhouse near Carreg Cennen Castle in Wales is dated to the 11th century. Many longhouses are still inhabited today (although adapted over the centuries), while others have been converted into farm buildings. Forms of longhouses identical to those on Dartmoor are found in Cornwall, particularly on Bodmin Moor and in Wales where they are commonly called tyddyn meaning 'homestead', or specifically Ty Hir meaning 'long-house' in the Welsh language. A near identical type called the (Maison) Longère can also be found in northwestern (Brittany, Normandy) and central France. Higher Uppacott, one of very few remaining longhouses to retain its original unaltered shippon and medieval thatch, is a Grade I listed building, and is now owned by the Dartmoor National Park Authority. Floorplan of a 17th-century Dartmoor longhouse, shippon to right. Another fine example of a 16th-century longhouse, extended and enlarged can be found at Cullacott near Launceston in Cornwall. The longhouse consists of a long, single-storey gable-ended granite structure built lengthwise down the slope of a hill, with a central 'cross-passage' dividing it into two rooms, sometimes partitioned with a screen. The higher end of the building was occupied by the human inhabitants; their animals were tethered in the lower, especially during the cold winter months. The animal quarters, called the 'shippon' or 'shippen'; a word still used by many locals to describe a farm building used for livestock, were located down the slope to allow slurry to drain out through the end wall. In Wales, the upper end was known as pen uchaf, the lower end pen isaf and the passage penllawr meaning 'head of the floor'. Early longhouses would have had no chimney - the smoke from a central fire simply filtered through the thatched roof and the whole space was open to the rafters, without a ceiling, as in a medieval English hall, to benefit from the heat of the open peat or furze hearth. Windows were very small or non-existent, so the interior would have been dark. The cross-passage had a door at either end, and with both of these open a breeze was often created which made it an ideal location for winnowing. Later in the medieval period, separation from the animals was increased with the introduction of enclosed stone fireplaces and upper floors inserted to create private bedrooms, while the roofspace above the shippen was often used as a hayloft or store. This simple floorplan is clearly visible at the abandoned mediaeval village at Hound Tor, which was inhabited from the mid-13th to the mid-15th centuries corresponding with the establishment of the Ancient Tenements on the high moorlands and abandoned as a result of depopulation following the Black Death after 1340. Excavations during the 1960s revealed four longhouses, many featuring a central drainage channel, and several smaller houses and barns. Peter Herring notes in his discussion of a medieval hamlet of six longhouses at Brown Willy in Cornwall dating from the mid-thirteenth century, that the shippons were typically orientated toward a common livestock holding area or 'townplace', whilst the raised human portion was carefully positioned away from the communal area for privacy. Roofs were originally thatched, with gardens and various agricultural outbuildings including communal corn-driers. In later centuries, the longhouses were adapted and expanded, often with the addition of an upper floor and a granite porch to protect against the elements. Substantial inglenook fireplaces and chimneys were also added, along with adjoining dairies, staircases and linhays and can be seen at many of the surviving Dartmoor longhouses today (see Ancient Tenements) which often have roofs replaced with local or Welsh slate, mainly in the nineteenth century. The ownership of an extensive longhouse is regarded as a sign of the relative prosperity of the rural region and longhouses would usually have been occupied by land-owning families rather than tenant peasants who would have occupied much humbler dwellings. ^ "The Dartmoor Longhouse". Dartmoor National Park Authority. ^ a b c d e f "The Medieval Countryside". Flying through Cornwall's Past. ^ "The Dartmoor Longhouse Poster" (PDF). Dartmoor National Park Authority. Archived from the original (PDF) on 27 September 2007. Retrieved 1 April 2008. ^ a b c d Peate, Iorwerth C. (1940). "The Welsh House: a study in folk culture". Y Cymmrodor. London. XLVII. ^ "The vernacular architecture of France". The Gateway to Dry Stone Architecture. ^ a b c "Interactive Visit to Higher Uppacott". Virtually Dartmoor. Retrieved 1 April 2008. ^ Newman, Phil (2006). "Tinworking and the Landscape of Medieval Devon, c1150-1700". In Turner, Sam. Medieval Devon & Cornwall; Shaping an Ancient Countryside. p. 125. ^ Herring, Peter (2006). "Medieval Fields at Brown Willy, Bodmin Moor". In Turner, Sam. Medieval Devon & Cornwall; Shaping an Ancient Countryside. 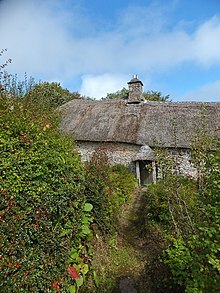 Wikimedia Commons has media related to Dartmoor longhouses.